When I lived in Barcelona, I walked past a crystal shop every day on my way to work. I would head out in the late afternoon sun for the evenings shift (I worked in a bar at the time), and I would always stop in that particular crystal store. The gemstones would catch the low light and look brilliant at that time of day. Obsessed with jewellery as I was, I almost always bought something too. A bracelet, a necklace, or a single stone to be placed in my pocket. I loved that store. It felt magical in some way, the colours of the stones seemed to hold more than the mineral content of which they were formed. 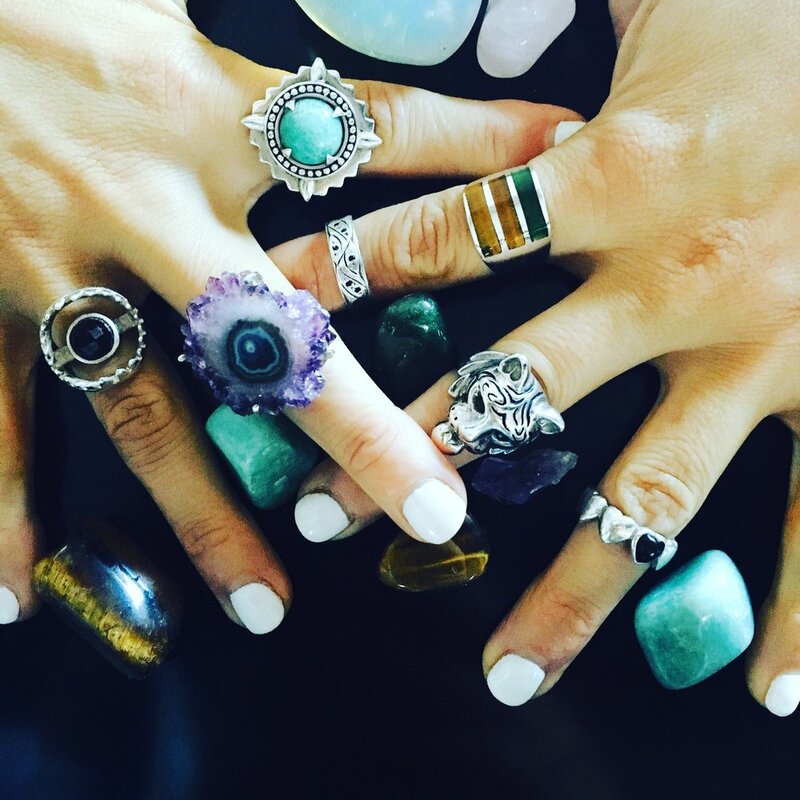 I still love to stop in at jewellery stores (I've never quite been able to wear less than four or five rings) so between cycling from Venice Beach to Santa Monica and stopping in at Moon Juice after taking a Yoga class, checking out the crystal shops in LA seemed like the next logical step. Some I happily stumbled upon in Santa Monica (found away from third street promenade, closer to second hand clothing stores) and some were definite destination stores, like Spellbound Sky (found at the junction between high LA fashion and new age cool). I was more than happy to let my inner Stevie Nicks shine, and ready to purchase a few extra pieces of jewellery for a already healthy collection. "That ones good for stress, and for the heart chakra". I held the piece of rose quartz up to the light, pinched between my thumb and index finger, and glanced at the man behind the till, whose jewellery collection rivalled Captain Jack Sparrows. Chakras, which literally means 'disk' or 'wheel' in Sanskrit, are energetic centres within the body, seven of which are stacked in a column of energy from the base of the spine to the crown of the head. As energy centres they have the ability to receive and express life force, chi, or Prana as it is called in Yoga. Each of the seven energetic centres that run along the spine resonate to a different element and represent seven different areas of human health. The fourth Chakra, Anahata Chakra, is the heart chakra. "Unconditional love". As Chakras are energetic centres, their energy can become blocked in the body, via different circumstances and events in our lives. Yoga asana (poses) and pranayama (breath control) work towards clearing these energetic blockages, allowing the energy in each chakra to flow freely. Gemstones are a compliment to this, as each stone has a different meaning and energetic effect. To get the most from a gemstone, it is advised to "place them near you, in your handbag or pocket, or on the body during meditation". Gemstones and their meanings have been around for thousands of years. Green Emeralds, also associated with the heart chakra, have long been affiliated with the goddess Venus for their ability to ensure security in love. Each Chakra in the body resonates to a different colour, ultimately forming a rainbow from base to crown. The heart chakras colour is green, mirroring emeralds hue. Emerald is said to have been a personal favourite of Cleopatras, representing not only wealth (Egypt was the first known location of emerald mining) but symbolising fertility and rebirth to the Egyptians. Romans carried the deep brown and yellows of Tigers Eye to deflect weapons and be brave in battle. Tigers Eye is associated with the third chakra, our solar plexus charka Manipura. Manipura resonates with the colour yellow and is our centre of self will, self esteem and self discipline. Amethyst, the birthstone for the star sign Aquarius, is associated with both the sixth and seventh chakras, for helping to balance cognition and intuition. For grounding the root chakra, our centre for safety and security, seek out red stones such as ruby and garnet. Our second chakra aligns with the orange colours of amber and represents emotions and sensuality, while the blue of the throat chakra, from where we speak our inner truth, finds a match in turquoise. The many meanings behind each gemstone are weaved throughout history, mirroring different cultures and paralleling their individual beliefs along the way. I was told that we are "naturally drawn to the stones that we need". Glancing down at my hands, which were close to having more rings than fingers, I found this a little concerning. My concern was replaced with delight as I spotted one that drew all of my attention. Some clever soul had taken a vintage troll doll, removed it's tuft of brightly coloured synthetic hair, and replaced it with long natural gemstones which rose vertically out of the trolls head, like a mini city full of skyscrapers. Holding the doll adorned with a crown of jewels, my mind wandered back to the troll collection I'd had as a kid. The combination of meaningful gemstones with the magic of childhood proved to be too much of a pull. I left one of the many crystal shops to be explored in LA not with a new ring, as was anticipated, but with a blinged out troll doll resurrected from the nineties and bought into the New Age.